Isn’t this Lou Ferringo, the impersonator of The Hulk (bigger version)? AndrÃƒÆ’Ã‚Â© was HUGE. Not to mention his great role in The Princess Bride. 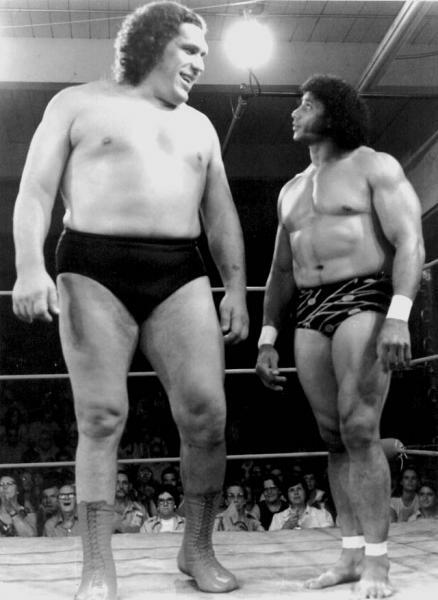 Isn’t the puny shrimp next to Andre, Jimmy “Super Fly” Snooka? Poor guy totally rooted his back wrestling. In Princess Bride, whenever he had to pick anyone up they had to be suspended on hidden cables. Rest in peace, Andre. I’ve got to give props to Mistergreen for realizing who the guy on the right is. Super fly was the man back in those days.